After the Flight Age tention mounts and the World is thrown in to its first true "world war". But unlike Earth's this is over slavery. The River and Grassland Tribe for the fist time in history have join forces in the idea of anti slavery. But The Desert, Mountain and New World conies do not want anything do do with it. The reason is the Desert Tribe uses them to convert their barren desert into a lush agricultural center, the Mountain tribe use them for plentiful mining and the new colonies use them for plantations. Due to the River and Grassland Colonies separate from their home tribes into the Plantation (River tribe's colony) and Slavery Tribes (Grassland Tribe's colony). For the Slavery tribe would get rich off capturing salves from the ocean, swamp and jungle tribe while the Plantation tribe would get rich of selling plentiful crops off the plantations to the desert and mountain tribe. Also the cave tribe is neutral during this time. As the War escalates the 2 super powers Grassland and River Tribe create amazing new aircraft, sea craft and ground vehicles. 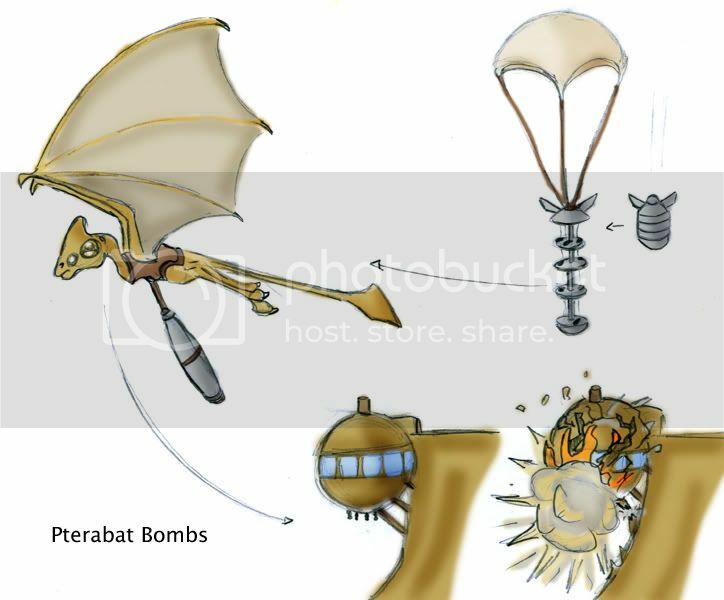 One of the lesser known but very effective weapons is shown here in the "pterabat bombs". Pterabats are nocturnal desert creatures who roost in caves and under the bootom of Desert Tribe sphere homes. Taking advantage of this behavioral trait the River Nauceans developed the "pterabat bomb". This bomb drops out of their bombers and opens up its parachute. Once open the compartments slide out with sleeping pterabats on them tied to thin strings. One awake they see a roost because its day. Attached to them is a timed explosive that when they break the thin string activates it for a limited time. Enough so that the bats can find roosts all over the Desert tribes city. And then when the timers run out ... BOOM! Sphere homes bust into flames and the cities are inflamed. On a side note America during World War II developed this same method with Mexican Freetail Bats with Naplam attached to them to drop over Japan. This project did not get to be applied in the war due to the Atom Bomb which made this very effective method obsolete. Here is a timeline. I left Shadow images of the ages not filled in yet. But its not set in stone yet. I might adjust it. But it gives you a good idea of what happened up to the final UFO stage which i call "Galactic Age". Nice timeline! It'll certainly be cool to see how it progresses. yea, I had a hard time viewing it too, so I saved it and viewed it on Jasc photoshop. 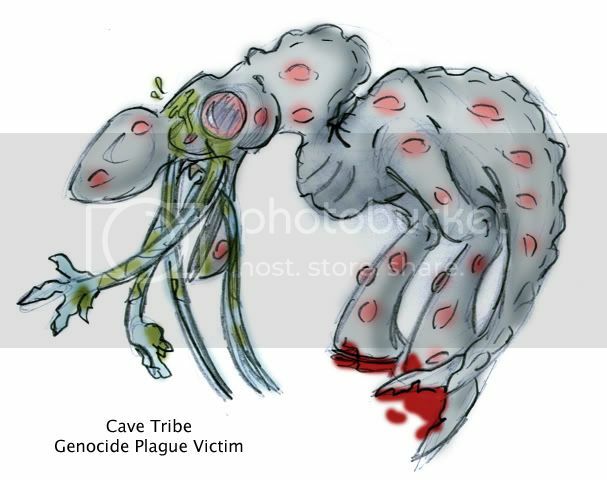 Here is a Cave Tribe Genocide Plague Victim. Durring the Biotech Age the Desert Tribe unleashed a plague specifically targeted towards the Cave tribe which completely wiped them out. This allowed for the capture of the cave tribes mines for the desert tribe and angered the Mountain, River and Grassland Tribes. Unfortunately the Mountain tribe was close enough related to kill of half of the population as well as a 4th of the Grassland River and Swamp races. The Ocean, Desert and Jungle were all do diffrent to be effected by the plague except for rare circumstances. This race specific plague caused huge boils, vomiting, running nose, blindness, starvation, raw flippers, trouble breathing, the body eating itself from the inside, internal hemeraging and diarrhea. If they were not killed in the first concentrated exposer they were killed with long painful suffering. It is airborn and spread to the other tribe mentioned before quickly. This meant an easy take over of the Desert tribe without the help of the River and Grassland tribe which were in a panic that they got effected too. Here is a simple animation of my Naucean walking. He kinda slides but i thought it was good for a first try. This was done in 3DStudio Max (but could be done in g-max) and then converted from AVI to Animated GIF using Adobe Premier. No becuase it still uploading to my site The full one works smooth and walks all th way to the right. Has jsut a few more mins left. I will post when its done. The river tribe can! The river triiiiibe! yes the river tribe can!